2702 People Claimed This Deal! Ranking at the Top of Google has proven time and time again to generate massive amounts of FREE, highly targeted traffic that converts! Not only that, but the #1 spot gets MORE traffic than the total traffic of the #2, 3, 4, and 5 spots COMBINED! 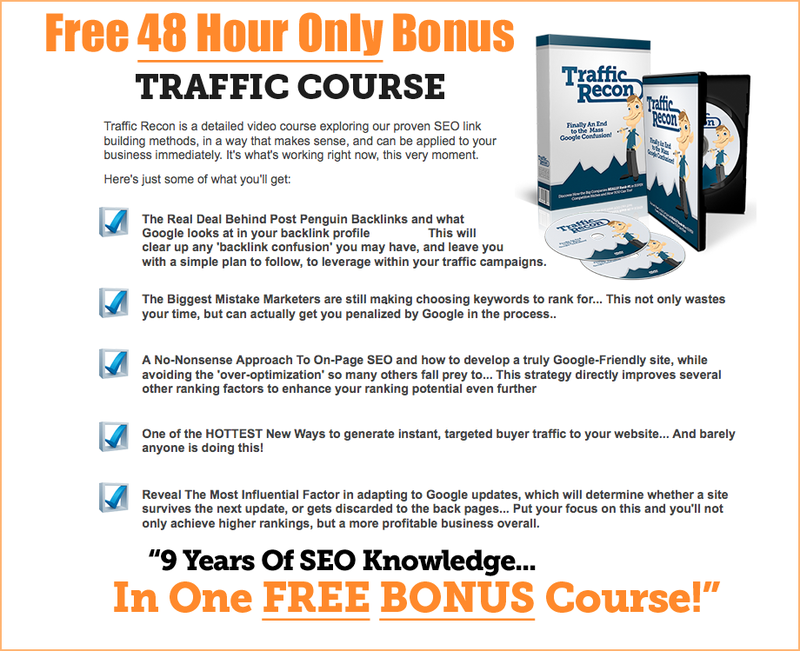 So even if you're on the top page, you're not guaranteed to get a ton of traffic. And that goes without saying that if you're on page 2 or beyond, you're probably not getting enough traffic to convert anything to sales. The #1 most important thing online is traffic. Hands Down! You can have the best product in the world, but if you don't have anyone to buy it, you won't make a dime! It's simple math. 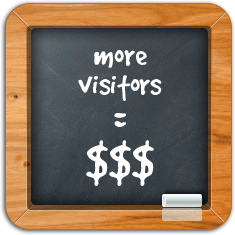 The more visitors you have, the more products you'll sell. The problem most website owners face is ranking at the top of Google, or any other search engine for that matter. "How does Google decide which sites to rank highest in their results? And why does Google choose one site over another?" Why is Google choosing to rank your competitor's website higher than yours, when clearly your website is what the visitor is looking for... right? Your site has better content and a better service than your competitors'. So let's take a step back for a minute and try to examine WHY Google is ranking the other sites at the top of Google. What is it about THOSE sites that Google likes? There's one thing we need to understand FIRST. And this one foundational idea is constant among ALL search engines (Google, Bing, Yahoo... all the way down to the smallest "no name" search engine). It's the number one most important factor in ranking a website. Remember, Google is a "computer algorithm". So it has to be told what to look for. It CANNOT subjectively look at a site and determine if it's better than it's competitor just because it "looks prettier". But it CAN follow links from site-to-site to see if a website is deemed "popular". This is called a Linking Profile. And from this Linking Profile, Google ranks what it thinks is the most popular site as #1. And this is why your linking profile is SO important. When other sites on the internet link to your site, it's like giving your site a vote. It's saying "Check out this guy's website, it's awesome!" And even more... a vote from an Authority figure (like say from the New York Times website) is given even more weight. "So all I need to do is get a ton of links pointing to my website and I'll rank #1 in Google?" Absolutely not. This couldn't be further from the truth. It's not just about getting a lot of links. It's now more about getting the right kinds of links, in the right way, with the right keywords, and in the way that Google wants. "Then how do we know what Google likes to see in our linking profiles?" We just have to dig a little to find it. What we have to do is look at what Google is already ranking at the top of its results, and dive in to the linking profiles of THOSE sites. If their sites are ranking in Google, all you have to do is find out what Google likes about those sites' linking profiles, and then emulate what they're doing. How many links do they have? What keyword anchor texts are they using in their backlinks? How diverse are their backlinks? What are their link densities for the anchor texts they're using? Even more important than the sheer number of links.... you need to build backlinks using the RIGHT anchor text keywords and in the right proportions. Again, look at your competition. What percentage of their backlinks are using the exact keyword that they're ranking for? What percentage of their backlinks are using other related keywords or a "URL as the keyword"? 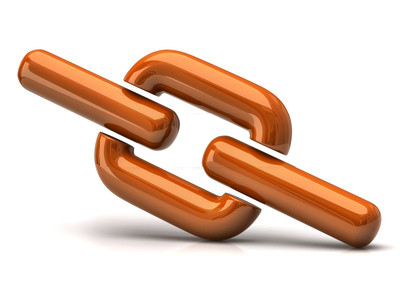 More important than ever, you NEED to know what your linking profile looks like. This is the biggest determining factor when it comes to ranking on Google. No longer do we have to guess blindly as to why your competitors are ranking so high in Google. It doesn't matter if Google updates their algorithm every week! With Rank Recon, you can always be one step ahead of your competition because you can now instantly view the linking profiles of any website for any keyword! Simply enter the keyword you're trying to rank for, with your website URL. Rank Recon will return YOUR entire linking profile percentages automatically. Not only that, but it then grabs your top ranking competitors' linking profiles and allows you to do side-by-side comparisons to see EXACTLY what you need to do to out-compete them in Google. Never-before has this data been available to the public. Google is showing us which sites they think are important. They're telling us which sites they like most. All you have to do is take the data and start building backlinks in the exact way that Google loves. Social Signals are now a much bigger player in the SEO game than ever before. Facebook, Twitter, LinkedIn, Google+, and others play a vital role in the rankings for many websites on Google. 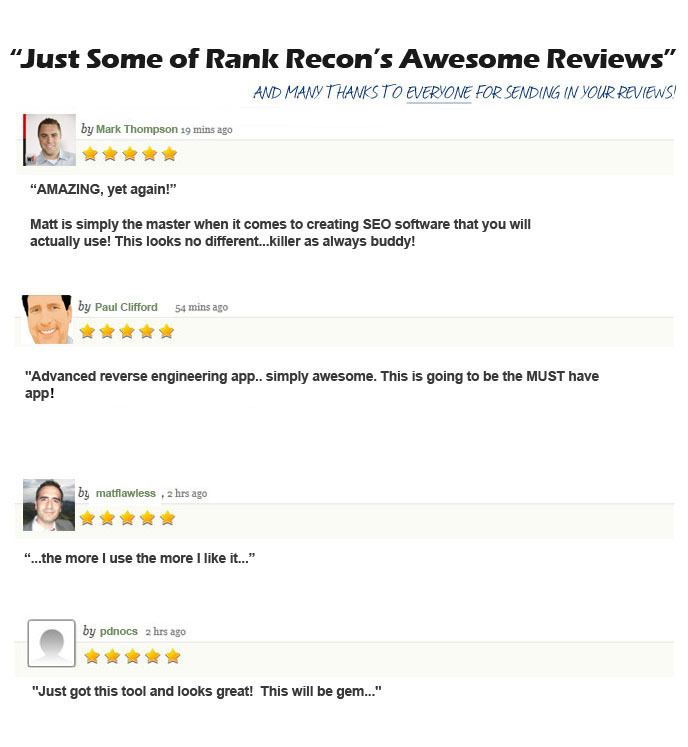 And because of this, Rank Recon now has the ability to provide this social intelligence about your competitors' sites. Ever wonder how your competition is out-ranking you when they only have a few backlinks pointing to their website? Many times it's because of these social signals. Google can now easily tell if a website is being talked about in the social network sites like Facebook and Twitter. Knowing how to out-compete your competition for a single keyword can now easily be done with the help of our competition analysis features. But even more... knowing what other keywords your website is ALREADY ranking for is an even BIGGER advantage over your competition! The more advantages you have over your competition, the more clients you'll earn! It's as simple as that. We're so confident that Rank Recon will help do more for your business and traffic than any other seo analysis software on the market. If you disagree, then during the first 30 days just ask for a refund and I will gladly refund your money, and wish you the best. If you'd like to give Rank Recon a try, completely risk free for 30 days, just click the button below to get instant access. Or you can let Rank Recon to do it automatically for you... laying out the exact formula you need to rank at the top of Google. Click the button below to get full access today! Copyright © 2019 RankRecon.com. iNet Innovation, Inc. All Rights Reserved.